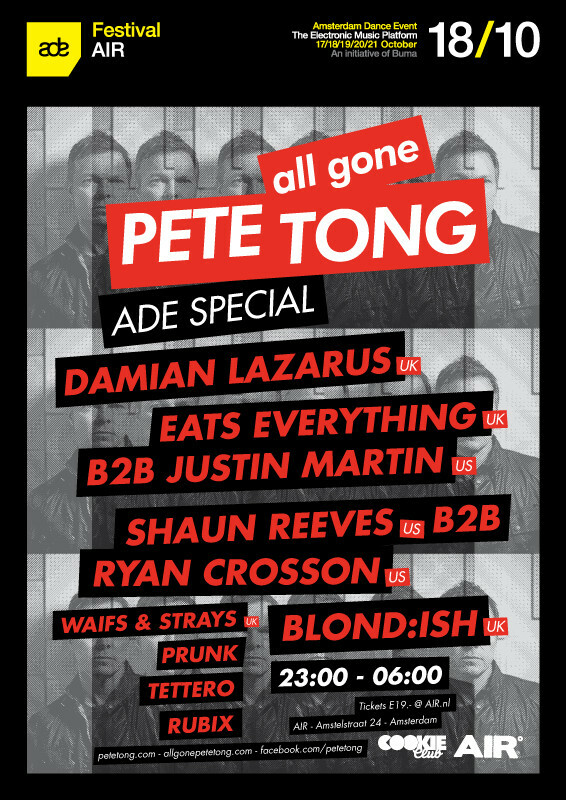 Next Thursday 18 October Pete Tong will take his ‘All Gone’ concept to the Amsterdam Dance Event (ADE) at Air. He’ll be joined by the cream of today’s electronic music talent with a line-up including Crosstown Records’ boss Damian Lazarus, back to back sets from Visionquest’s Shaun Reeves with Ryan Crosson, and Eats Everything with Justin Martin, and a debut ADE performance from Canadian sensations BLOND:ISH. AIR’s weekly concept, CookieClub, will host AIR2 with Waifs & Strays and residents Prunk, Tettero and Rubix. From its roots at Pacha in Ibiza, Pete has taken the ‘All Gone’ concept across the world, from a sold-out UK tour, an exclusive show in Moscow, and then on to his legendary pool party in Miami. In May, 'All Gone's' debut visit to Holland for the Pacha Festival, saw Pete host an arena alongside Carl Craig presents 69 Live, Dennis Ferrer, Stacey Pullen, Matthias Tanzmann, 2000AndOne and Taras van De Voorde. And more recently ‘All Gone’ touched down in central London with an arena at SW4 festival with Seth Troxler, Sasha, Eats Everything, Maya Jane Coles and many more gracing the DJ Booth. Tickets. I always used to study paragraph in news papers but now as I am a user of net so from now I am using net for articles or reviews, thanks to web. For hottest information you have to visit world wide web and on the web I found this web page as a most excellent website for hottest updates.